I have been updating some of my Slackware packages in the past few days and at least some of them are important enough to write a bit about it. Along with my packages for KDE 4.7.x I added an updated version of virtuoso “data management server” which powers a lot of the functionality in today’s KDE: However there was a regression in this version 6.1.3 which messed up the display of path names containing non-ascii (i..e Unicide) characters. See https://bugs.kde.org/show_bug.cgi?id=271664 for more details about this issue. I applied a fix to my virtuoso-ose package which solves this. Package available here in the 4.7.1 section: http://alien.slackbook.org/ktown/ as well as all the usual mirrors. Martin Graesslin wrote an email to the KDE packagers mailing list with the plea to apply a patch to all binary packages of kde-workspace after he discovered a bug in KWin’s handling of desktop effects which apparently has been present in all versions since 4.0. The bug would cause a performance degradation which becomes worse when more windows are open on the desktop. Martin’s blog article describes how he discovered the bug during his performance analysis of KDE 4.8 code. I have applied the patch he provided in his email to my KDE 4.7.1 kde-workspace package and I will wait for a backport to KDE 4.6.x before attempting to apply the fix to the kdebase-workspace package in there. This is not a package update per sé. I have been compiling the development version of the VLC media player for a long time (I think I started re-writing the vlc.SlackBuild script for the development snapshots in January 2011). I had varying success with the package, as my build script would “break” from time to time. When someone in the #videolan IRC channel wondered if the development code would work better for high-bandwidth H.264 movies (VLC 1.1.11 drops too many frames) and a VLC developer suggested that the development code has a lot of optimizations in this regard, I decided to release a package based on my SlackBuild script. I called the package directory “vlcgit” and the build script “vlcgit.SlackBuild” but the actual package is named “vlc” so that you can easily update from 1.1.11 to this development snapshot. The vlc program will identity itself as “1.2.0-git” when it starts. I think it is worth your while to try it out because there have been lots of enhancements and additional features in the past year. VLC 1.2.0 is expected to be released before the end of 2011. Packages here: http://slackware.com/~alien/slackbuilds/vlcgit/ (which is a US server so these packages do not contain the mp3 and aac encoders because of patent disputes) and at http://taper.alienbase.nl/mirrors/people/alien/restricted_slackbuilds/vlcgit/ (for the version that includes mp3 and aac audio ENcoding capability). Also available on all the other mirrors of course. The Adobe people are finally putting good effort into their Linux flash player plugin. One month after the “beta 2” release we now have the “release candidate 1” of the upcoming Flash Player 11. It looks like the releases for Linux and Windows platforms go hand in hand now, which is a reassuring sign that we Linux users are taken seriously. The calibre download page states that you should “not use your distribution provided calibre package, as those are often buggy/outdated. Instead use the Binary install described below“. Of course you are free to follow that advice, but if you prefer to know how your packages get built, like me, you can still grab the packages that I provide. There is a new release of Calibre every friday and I have been following that release cycle for the past months, releasing updated packages the same day. I use Calibre every day and am happy with my builds. If you are seriously into writing or converting e-books, then Calibre is the perfect management and conversion software for the task. But Calibre does not offer an actual epub editor. Epub is an open specification for electronic books and widely used all over the world except for the US apparently where Amazon dominates with the mobi format used for its Kindle. Both mobi and epub formats are quite similar, basically it is HTML text plus a book’s metadata, bundled together in a ZIP archive. Whether you are writing an ebook yourself, or need to clean up an ebook provided by someone else, there is one application which is best suited for this task: Sigil. 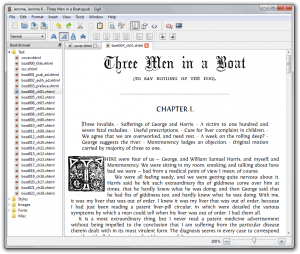 Sigil is designed to edit epub format only. It contains an embedded HTML tidy which cleans up the book’s HTML code autimatically and an embedded Flightcrew, which assists you in validating your book to the EPUB specification. The Sigil homepage offers pre-built binaries, but these are quite big. Since they have to work everywhere the binaries include a lot of libraries which we already have in Slackware. The new Sigil maintainer seems to be very responsive so I asked him if he could put up a page with distro-specific packages and add a link to my Slackware package there. He did that right away, and more distros have been added there since. Get the package fir Sigil here: http://slackware.com/~alien/slackbuilds/sigil/ . Willy Sudiarto Raharjo pointed out that there was another package update and I failed to mention it. The 32bit package “libbluedevil” was not tagged with my “alien” tag initially, and I fixed that by renaming the affected files in the repository. Posted: 11 September, 2011 in Slackware, Software. Your vlcgit restrict link is broken because you have a trailing space in your link “http://taper.alienbase.nl/mirrors/people/alien/restricted_slackbuilds/vlcgit/” so that a firefox ‘Copy Link Location’ gives this: http://taper.alienbase.nl/mirrors/people/alien/restricted_slackbuilds/vlcgit/%20 which gives a 404 error when followed. Thanks for pointing out the broken link, it’s been fixed now. I’m impressed with VLC. They’re still keeping the interface pretty simple while introducing various enhancements. If there’d be a full-blown fb2 editor… the existing ones are for win only and poorly docummented. OO/LibOO plugin also does not help a lot. So they fixed the soundbugs then. Thanks for all your efforts to bring us updated software Eric. I wish too that there would be a bit more movement. Such is life, and Pat is busy with other things. I’ll just keep updating my KDE and LibreOffice in the meantime (updates to both should be around the corner). Just want to say thanks for the hard work maintaining these KDE packages, fantastic job you are doing. I am running firefox 7.0 here (official Slackware-current package which has not yet been released to the public) with my flash-player 11.rc1 package, and I have not seen crashes yet (tried http://www.adobe.com/software/flash/about/ to see that it is recognized properly). I’ve been using your packages for a long long time as of now, always successfully, thank you very much for your hard work and for making it available for the public. Do you see any reason why the 4.7.1 packages couldn’t be built on 13.37? I fancy running them so am thinking about just building your source packages on my 13.37 machine. Thank you for the stirling work that you do on this! It is entirely possible to compile KDE 4.7.1 on Slackware 13.37. It’s just that my own target for new KDE packages is slackware-current since that is where they eventually should get included (once Pat updates his). At the moment Slackware 13.37 and -current still have not diverged too far. Once KDE is going to depend on newer libraries than Slackware 13.37 provides, you may have to update a few more dependencies than I already do (just look at the “deps” directory which is already full of updates to stock packages). My goal this this machine is to get a slightly shinier kde experience without intruding too much on the core installation. This probably means that I should stick with your 4.6.5 sources and rebuild them to sort out the perl issues. I have reporst from several people that my pre-compiled KDE 4.7.1 packages work well on Slackware 13.37 – you might want to try that first. There is not so much KDE stuff that actually uses Perl, so the “damage” will be very limited. You got lucky! I just uploaded some packages for the official stable flasplayer-plugin 11 … go get them! Streaming server doesn’t have problem with this link. a llot often inside case you shield this hike.